Heather Jensen, the new curator at the Fort Museum & Frontier Village, looks through a book of records in the east display room. 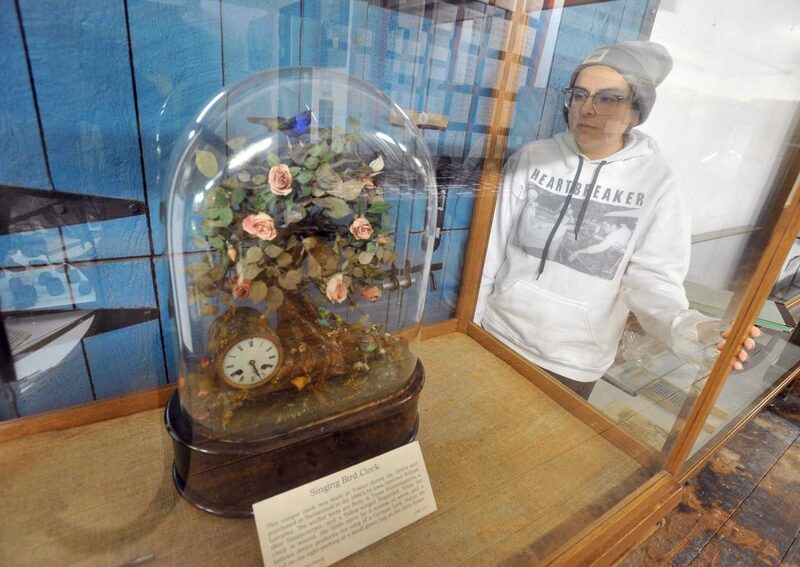 The Fort Museum & Frontier Village’s new curator, Heather Jensen, looks over one of her favorite exhibits, a singing bird clock made in the 1840s. 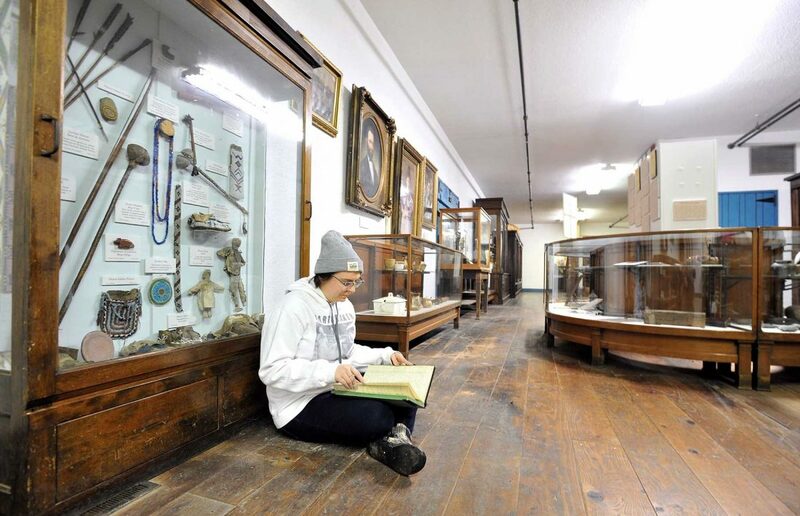 There are a lot of interesting, fun and diverse objects in the collection of the Fort Museum & Frontier Village. Some of them are still in need of being sorted, labeled and displayed properly. Heather Jensen, as the Fort’s new curator, will be doing that. She started her duties Oct. 8, 2018. Jensen, who grew up in Romeville, Illinois, landed in the area when her husband took a job in Humboldt. She holds a BA degree in anthropology and has a master’s in museum management. She was already familiar with the Fort and had spent some time there. “The rest is history,” she said. As an anthropologist, one of the items in the collection was a really exciting find for her. She also recently helped locate all of a bit of ceramic history in the collection. Previously, only one piece of the tea set had its whereabouts known. She’s also found an artifact from William Williams exciting. She’s found several other things quite fascinating. The replica of the Cardiff giant has also caught her attention. “It’s just crazy and super fun,” she said. 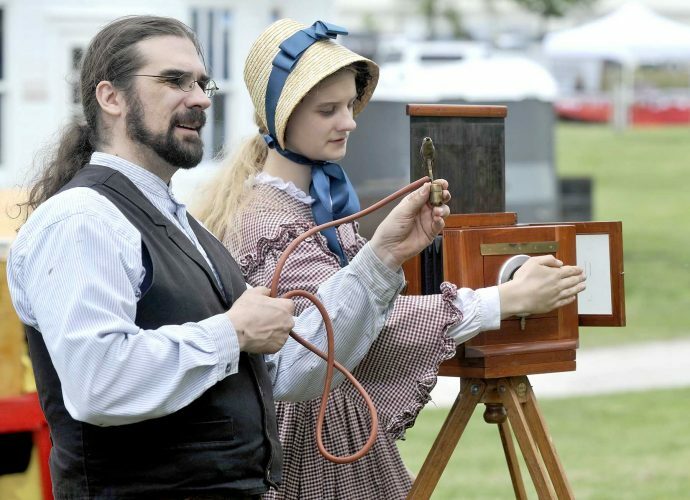 The 150th birthday of Fort Dodge is also close to the 150th birthday of the gypsum giant. They’ll be throwing a party in September. For those who might be concerned with such things, she’s assuring the public that the Cardiff Giant’s anatomical correctness will be, well, covered up. She’s also planning on working on upgrading signage, moving some of the artifacts around in the various buildings and even creating a scavenger hunt and signs that lead the visitor to other buildings. Her goal is make the Fort a more interesting, unique and family-friendly place to visit. There’s a lot to do and she’s ready to tackle the job. “It will be a learning curve,” she said. The Fort’s collection is in good hands.